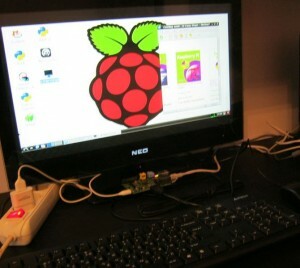 Our Raspberry Pi – up and running! The Raspberry Pi is a cheap, programmable credit-card sized computer. It wasn’t created by Apple. In fact, it wasn’t created by any business, but by a charitable foundation. Its goal? To make learning computer science accessible once more to everyone, especially young people. It costs approx £25/$35 and you’ll need to add your own keyboard, mouse and monitor. For storage, it uses an SD card, similar to those found in digital cameras. It’s a capable little PC which can be used for many of the things that your desktop PC does, like browsing the internet, spreadsheets, word-processing and games. It also plays high-definition video. “The Raspbian “wheezy” Linux image is currently recommended for beginners at raspberrypi.org. While downloading the Raspbian image I connected a USB mouse and a USB keyboard to the Raspberry Pi. I then connected my TV to the Raspberry Pi’s HDMI socket to use as a display. I also connected my modem to its Ethernet socket for a wired internet connection. When the download finished I wrote the Raspbian image onto an SD card with Win32DiskImager. Next I inserted the SD card into the Raspberry Pi then connected my Kindle charger to its MicroUSB slot. Eagerly I switched on the power and was soon being asked to login – on my TV! Typing the default login “pi” and default password “raspberry” then placed me at a command prompt. There typing the command “startx” quickly loaded a familiar looking desktop screen. Instinctively I clicked the “Start” button in the bottom left corner of the desktop and up popped menus. Choosing the “Internet” menu I then clicked on “NetSurf Web Browser” and there I was, surfing the web. Given the limited capabilities of the Raspberry Pi the appearance of the desktop is surprisingly good. But remember that the Raspberry Pi is primarily intended as a learning device. Keep checking our website for updates on this forthcoming title.